One of my favourite things about London’s skyline is the number of decadent restaurants that reside in many of the city’s best landmarks. 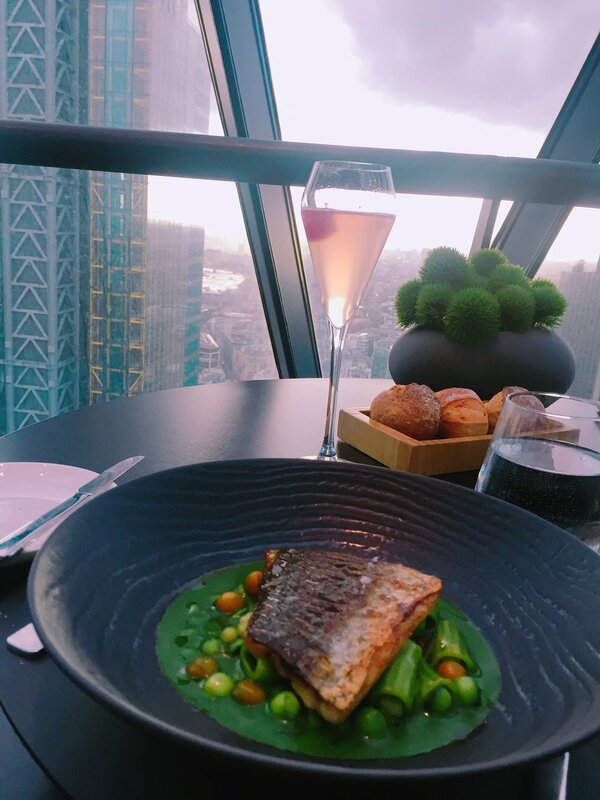 One such beautiful restaurant is Searcys at the Gherkin. 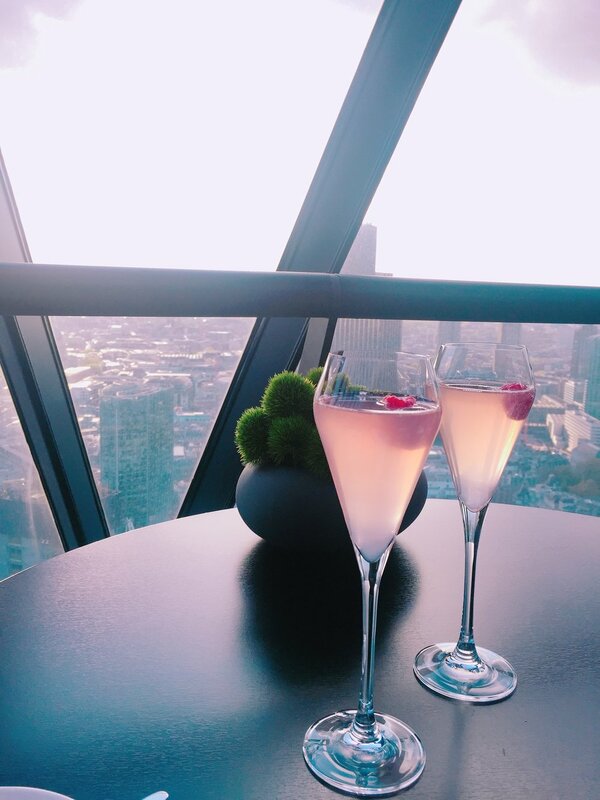 With stunning views of London from its 39th-floor location, Searcys at the Gherkin has 360-degree glass walls which result in uninterrupted city panoramas from its bar and restaurant. As a result Searcys is a stunning, calm and luxurious setting for a meal in London. I dined at Searcys as part of Bookatable’s Feast on London festival, which saw the capital’s best restaurants offering specialised set-menus and experiences. Our three course set menu included a refreshing sparkling raspberry and champagne welcome drink which set the scene perfectly for the meal which was to follow. We were offered a trio of breads including white, brown and onion as an accompaniment and for my starter I tried the ricotta and tomato salad. The ricotta was rich and smooth which complimented the sweet yet sharp taste of the tomatoes. 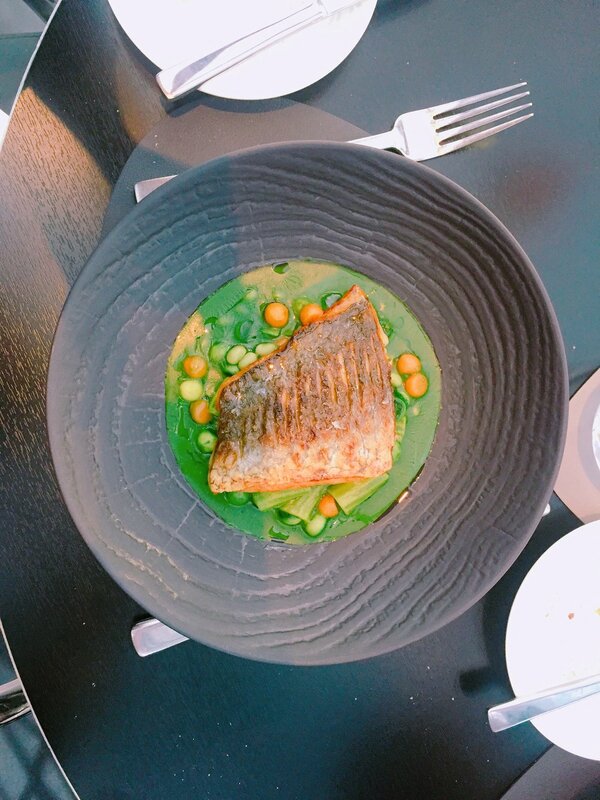 For my main course I tried a Searcys favourites, sea bream with pea volute and vegetables. This was a beautiful light dish full of the soft and subtle flavours of sea bream. We also tried the beef wellington which was served with smooth mash potatoes, carrots and wild cress. The dessert options on the menu were immensely compelling and we decided on a creamy but delicate rice pudding served with fresh slices of strawberry, and a chocolate fondant served with contrasting sharp sauces adding a delightful kick to the dish. Both desserts acted as the perfect end of the refined and enjoyable meal. As well as the food, Searcys prides itself on its polished cocktails and drinks. To accompany our meal we tried the Ultraviolet made with blackberries, lime & mint homemade shrub, crème de violet, Prosecco and Laika, made of vanilla vodka, rose liqueur, Lychee juice, champagne. Searcys offers a refined and irresistible a la carte menu as well as a immensely well-priced set-menus. Our meal booked through Bookatable consisted of a three course dinner and a welcome drink for £47 each, which is similar to the prices diners can expect to pay in many other standard restaurants in London. 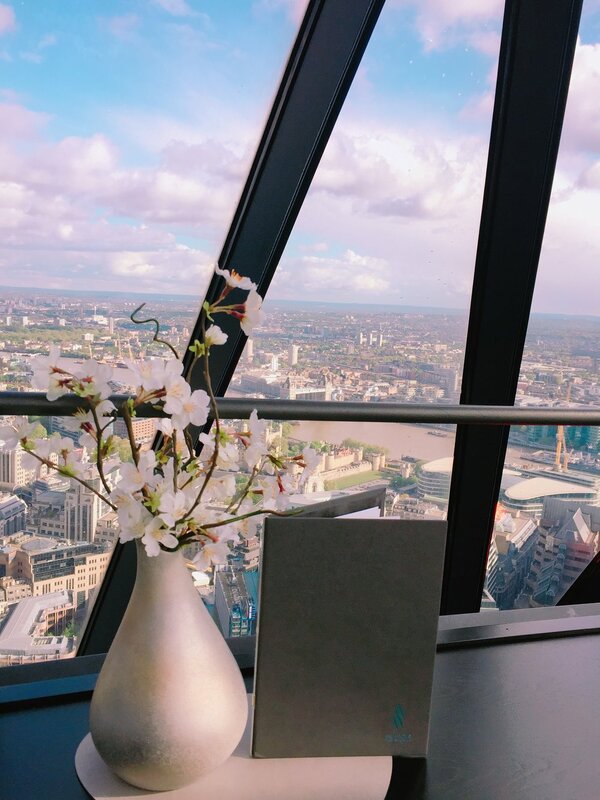 Bookatable often offer these set-meals for Searchys at the Gherkin, including brunch and on special occasions such as upcoming Father's day so it is worth keeping a look out for their offers! Searcys sits in one of the world's most striking buildings which instantly makes it a must visit destination in London. But as well as the setting, it is also the food and drinks on offer that make Searcys one of London’s most desirable dining experiences.